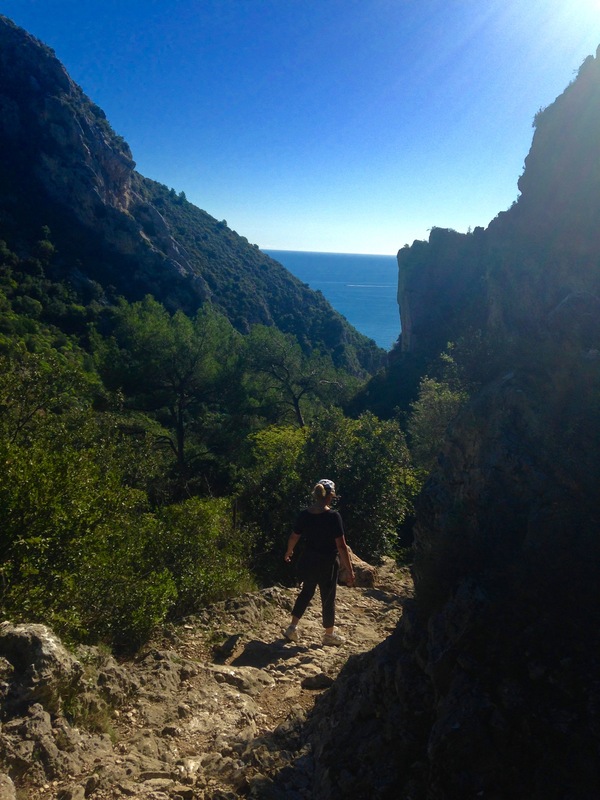 This past week we decided to take the #81 bus up to Eze from Nice and hike one of the trails close by. We chose a marked trail that would take us up to the Fort de La Revere (and goes by the same name), which is about a 4 km hike and would takes us a couple of hours. It’s a loop that leaves Eze, heads north and upwards, and there returns back down to Eze village. 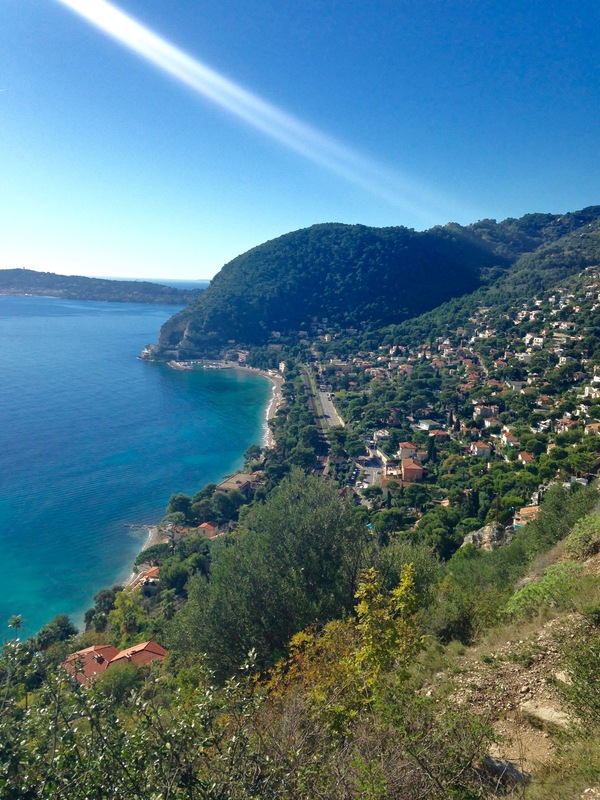 And all along the way there are amazing views looking back at the Cote d’Azur coastline. On this particular day the air was clear and you could see far down the coast towards Antibes and Cannes. One we had returned to Eze, Flo had the energy for more so we decided to walk the trail down from Eze Village to “Eze Sur-le-Mer” on the coast. The trail is called Le Sentier de Nietzsche as Nietzsche had spent some in Eze and supposedly he enjoyed walking the trail. At the beginning is a sign signifying this and a quote from his poem From the Heights. MIDDAY of Life! Oh, season of delight! Where linger ye, my friends? The time is right! Which got me thinking, as we began our descent, that we are actually in the “midday of our lives” and having recently entered our retirement years, would this be our “season of delight”? The fact it was now sold, however, meant we could no longer rely on our business to provide us with the goals and challenges we seem, as human beings, to need. For much of our lives we have to get up early 5-6 days of the week, put in about eight hours a day, and during this time we are provided with structure, goals and challenges. But what happens when work ends and retirement begins? Where are the goals and challenges to come from? Does this mean I have to create that “structure” by myself, on my own? In short, goals give life meaning, and work is a wonderful structure for providing exactly that. When we are at work we’re pushed to engage in activities we find satisfying. We’re happiest when we’re absorbed in a difficult task, a task that has clear goals and that challenges us not only to exercise our talents but to stretch them. At the same time we become so immersed in the flow of our work that we tune out distractions and transcend the anxieties and worries that plague our everyday lives. Our attention, which too often can wander, becomes fixed on what we’re doing. Work then provides an outlet, a means of dealing with the pressures of day-to-day life, although most of us we’d think it was the other way around, that it was work that was demanding and pressured, that we actually need more leisure time. Mihaly performed an interesting study where he asks people to wear a beeper which beeped every hour as a reminder for them to make a note of how they were feeling at that moment. The results were tracked and what they found was that people are actually happier when they are at work than they are during their leisure time! Too often they were bored during their free time. And yet when asked, they said they didn’t like being at work, would rather be enjoying time off. Mihaly referred to this phenomenon as “the paradox of work.” When they were on the job, they expressed a strong desire to be off the job, and when they were off the job, the last thing they wanted was to go back to work. So again, what happens then, when work ends and there’s now just endless days of leisure? What will provide the goals and challenges we seem to need to give life meaning and structure? That become my train of thought and concern as we made our way down to the shores of the Mediterranean. This hike was certainly providing the challenge I needed for today, but what will it be tomorrow? 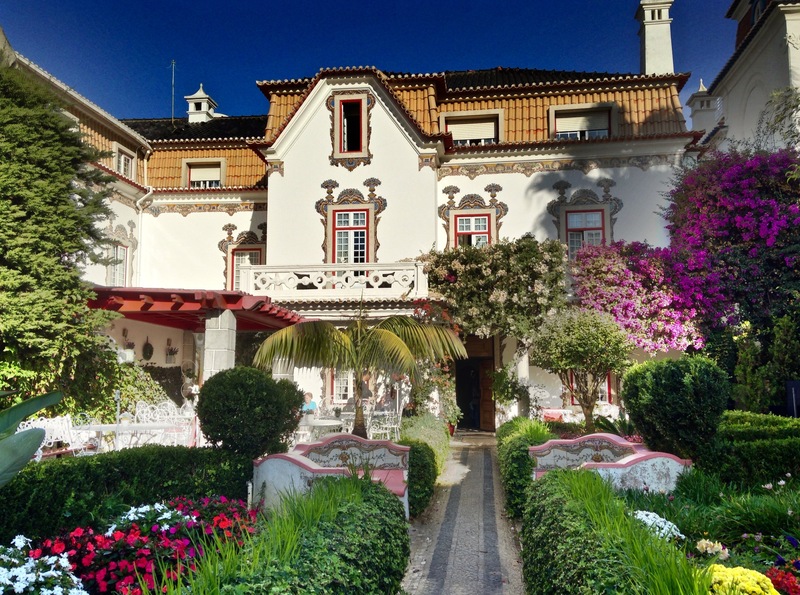 Portugal has become increasingly popular recently for people wanting to obtain residency in the country, because of its fiscal advantages and the opportunity to be able to live and travel throughout the European Union. Done correctly, the amount of tax payable on incomes earned outside of Portugal, can lead to one paying 0% in tax. The program is called the “Non-Habitual Resident” (NHR) taxation regime and it came into force in Portugal in 2009 and is proving very successful at attracting individuals of independent means to establish residency in Portugal for tax purposes, while not being subject to minimum or maximum stay requirements. In addition to the non-existence in Portugal of a wealth tax, or of inheritance/gift tax for close relatives, the NHR regime essentially grants qualifying individuals the possibility of becoming tax residents while legally avoiding or minimising income tax on certain categories of non-Portugal sourced income and capital gains for a period of 10 years. A major feature of the NHR regime lies in its interaction with the double tax conventions. In effect, most double tax conventions grant the possibility to tax most categories of income to the country of source of such income, although in practice, so as to attract foreign investment, many countries will not make use of that possibility to tax non-residents. Since most such categories will not be taxed in Portugal in the hands of a NHR because they may be taxed abroad, in practice most foreign-source income types will be zero taxed in such hands. An example would be individuals who own investments in Ireland or Luxembourg, two countries who are known not to withhold the 15% double-taxation tax. So, by owning the popular ETFs that are domiciled in these two countries, because Portugal doesn’t tax, you end by not being taxed at all. This exemption is available on dividends, interest and real estate income. Capital gains, however, are taxed, at least when you do sell. Some of this information has been taken from a great information booklet put together by Belion Partners. If you go to there website, you can download it or read it online, to find our more about this increasingly popular program, especially for French citizens! Our original plan was to spend a week exploring the south of Portugal, especially the Algarve region, but after so many days on the road, and pressing matters in Lisbon, we decided to just go south halfway for a couple of days, to a hotel we already had booked and would lose otherwise. We went along the coastline from Setubal, following the coast as much as we could. The coast, for the most part, is very much made up of sand dunes, brush, beaches and rock cliffs, and it is all quite remote. 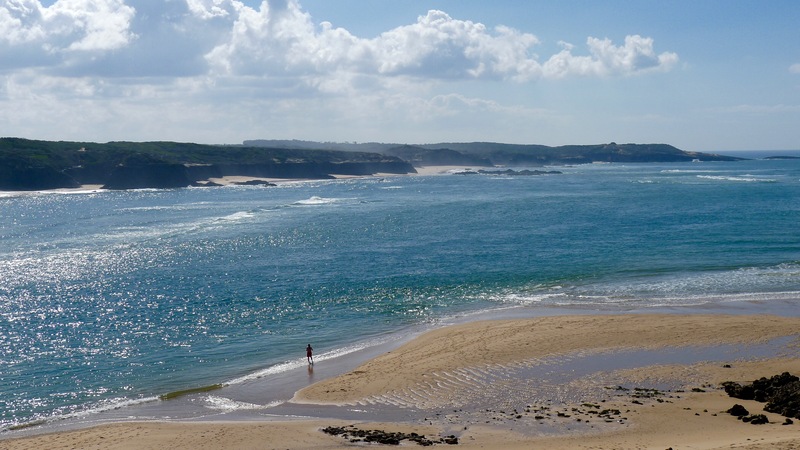 We passed through Porto Covo which looked nice and seems that it would be pretty popular for surfing in the summer. But it was all pretty dead in mid’ October. About halfway down the coast we came to the Mira River where the town of Vila Nova Milfontes is on the northerly shore. Nice town with great views looking southward, over the river and ocean and the wide, wide beaches. We had lunch in the village and then continued on to our hotel, Monte de Montejeiros, which is on the southern shore of the Mira. It isn’t exactly on the river but high up overlooking it, offering great views. In front there is a house with a pool, and then another building behind with three rooms and a shared common area kitchen/living room. Nicely done, but it is all rather small and remote. Would have preferred to be in the village where we could at least walk around the village. We went for a drive and walked the beach across from Milfontes. Fantastic beaches on this coast, with plenty of surf options. The Mira River is quite long but no road follows it so we didn’t get to see a lot of it. Looks like it would be great trip by boat, though. And that was it. We drove back keeping to the coast and drove up the Troia Peninsula, visiting the real estate development of the same name at the end of the point. It is quite built out with numerous condo towers and single family home developments, a golf course, marina and other amenities. But it was all very empty of people. Not sure how successful this development has been. Our second journey took place when we returned in the fall to take care of our residency papers and close on the sale of our apartment. We headed north to visit Lousa, the Douro region, Porto and Nazaré. Along the way we also met up with some friends from Canada, Dru and Ted and Kimi from Puerto Vallarta, Mexico. Lousa was chosen as a break for our drive up to the Douro River, and because we liked the pictures of the Lousa Palace Hotel in this small town just east of Coimbra. Not really a lot to see or do in town, but the hotel is quite something. There are large, elaborate sitting areas, the main dining room is amazing, and the rooms are spacious and wall appointed. And the price is right as well. But again, not a lot to do in Lousa! Since Portugal is going to be our place of residency for the next few years, we returned there this fall to travel the country and get to know it a little better. Portugal is not a big country, just 1% the size of the country I grew up in – Canada. So getting to know it shouldn’t take a lot of time. Our first journey out took us west and north, to Cascais, Sintra and Ericeira. Cascais is a beachfront town not far from Lisbon (30 minutes by car or train) situated where the Tigus meets the Atlantic Ocean. It is popular with tourists and is probably the most popular place for the rich and famous in the country to choose to live. Good for SUP and surf is very close by, as well as golf. Wonderful town to walk and a fun place to return to enjoy the many beaches in front and nearby. Plenty of shopping and a great selection of restaurants. We stayed at the Casa da Pergola House, which was just delightful. It’s situated right in the middle of town and just steps away from the train station. It is a guest house that, as their website says, “offers a journey through time and enchants guests with the scent and colour of the garden.” And that is surely does. We have been working on becoming Portuguese residents for some time now, as we have started a process to leave Mexico. Becoming Portuguese offers me full-time residency in Europe, so I can come and go as I please. Portugal also comes with some nice fiscal benefits. 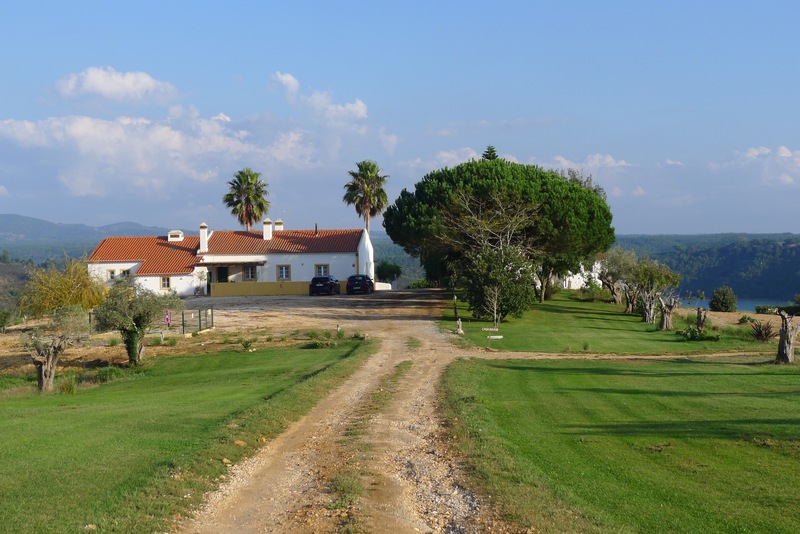 One part of the residency process involves having a home in the country so we bought an apartment in Lisbon. It was completely gutted when we saw it, which allowed us to design the layout ourselves and put in everything new. It was a fun experience and the contractors were great. They came in on budget and finished ahead of schedule. It is not big with only 50 m2, but we managed to make pretty good use of the space we have. It is 1/7th the size of our apartment back in Punta Mita, so a big change! 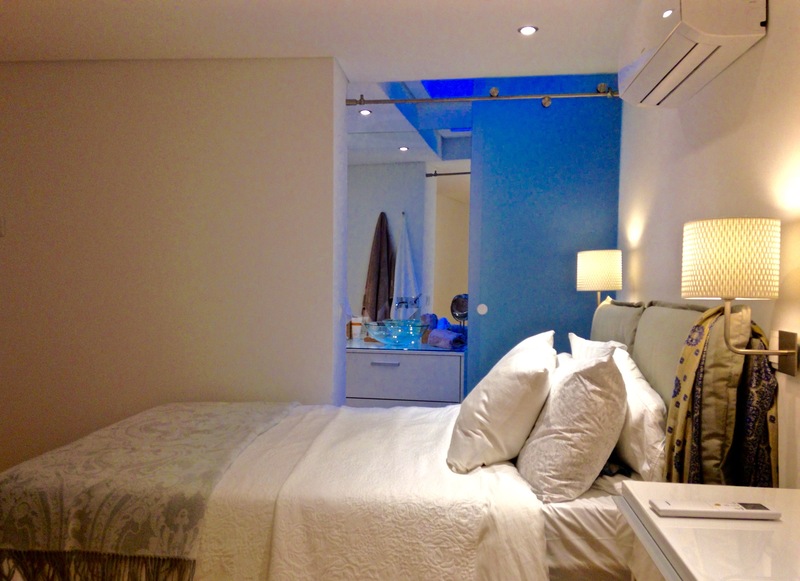 But it has a great location, beside Alfama and short walk into downtown Lisbon. The Apolonia train station and metro is steps away and its very easy getting to and from the airport. We moved in a few weeks ago and spent about a week buying all the things a new apartment needs.